If your leading lady is a Jeep lover, then look no further; JustForJeeps.com has plenty of Jeep products to please any woman. 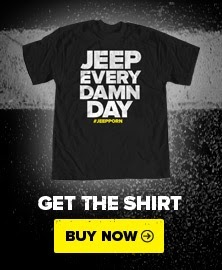 Let your woman wear her enthusiasm for this rugged American icon with JustForJeeps.com’s assortment of Jeep T-Shirts, hoodies and caps. These unique products are all available at significant savings from us. For the speedster in your life, our Jeep Wrangler Zoom Coral T-Shirt is a great choice. Like the rest of our line of clothing, this is a quality product. It’s double stitched and made of preshrunk 100 percent cotton. Simple, practical and tough enough for off-roading. For those bright sunny days out on the road or the trail, JustForJeeps.com stocks a variety of fashionable sunglasses, including unisex styles and ladies-only models. Our Jeep Spirit Women’s Sunglasses are strong but stylish, just like Jeeps. These German-manufactured sunglasses offer 100 percent UV protection from the sun’s harmful rays and come with a Jeep logo carrying case and cleaning cloth. We also sell products that your Jeep can wear, like license plates including our Jeep Pink License Plate. This 6” x 12” plate simply states the brand’s respected name in trademark black Jeep font on a vivid pink background — attractive but practical, like the vehicle it represents. We also have decals to add flair to your lady’s Jeep, like our Jeep Girls Rock Decal to show off her pride in her car and herself. For the activities of daily living, JustForJeeps.com has tons of useful items, such as grocery totes, roadside safety kits, Jeep messenger bags and towels. And for those with budding young Jeepsters in the family, we carry a variety of strollers, including jogging models. We even clothes for the little ones. For these options and many more, simply browse our website to find a deep stock of quality products at a price you’ll like with fast, friendly service, no-hassle online shopping and quick delivery right to your doorstep.